Towards the end of 2017 AMD's EPYC processor platform took its first confident steps into the cloud and data centre world with orders from the likes of Microsoft, HP and Baidu. Today, in partnership with Dell EMC, they enter the scalable 14th generation PowerEdge server range as the heart of three new rackmount server options for data centres. The PowerEdge R6415 and R7415 are single-socket solutions in a 1U and 2U form factor respectively. Unsurprisingly they both make significant use of EPYC's copious PCIe I/O capability, supporting 10 and 24 NMVe drives respectively, and scaling up to 32 EPYC cores (64 threads). The R7425 meanwhile is a two-socket solution supporting up to 64 cores that offer a substantial boost to the Data Analysis and HPC fields. As EPYC continues to flex its muscles, AMD are keen to reinforce their value in every product segment against their competitor based on performance in industry standard 'SPECrate' benchmarks of integer performance and available memory bandwidth. Furthermore, CPUs based on the AMD Zen architecture are not affected by Meltdown, one of the more worrying security vulnerabilities uncovered in CPUs in recent times. The launch event for the new PowerEdge servers is currently taking place in China, but the servers themselves are available to DELL EMC customers worldwide. More EPYC products from OEM and ODM partners are also in the works, so this is far from the last you'll hear of EPYC in 2018. ROUND ROCK, TEXAS, FEB. 6, 2018 - Dell EMC announced three new servers designed for software-defined environments, edge and high-performance computing (HPC). 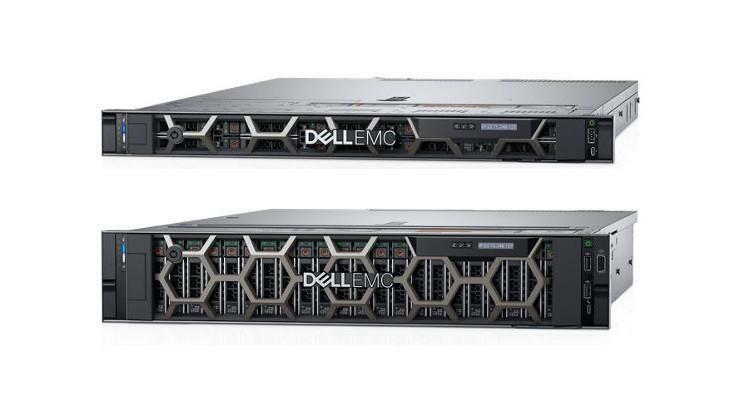 The PowerEdge R6415, PowerEdge R7415 and PowerEdge R7425 expand the 14th generation of the Dell EMC PowerEdge server portfolio with new capabilities to address the demanding workload requirements of today’s modern data center. All three rack servers with the AMD EPYC™ processor offer highly scalable platforms with outstanding total cost of ownership (TCO). The combined innovation of AMD EPYC™ processors and pioneering PowerEdge server technology deliver compute capabilities that optimally enhance emerging workloads. With up to 32 cores (64 threads), 8 memory channels and 128 PCIe lanes, AMD’s EPYC™ processors offer flexibility, performance, and security features for today’s software defined ecosystem. Technology is at a relentless pace of scale and record adoption, which has resulted in emerging workloads that are growing in scale and scope. These workloads are driving new system requirements and features that are, in turn, advancing development and adoption of technologies such as NVMe, FPGAs and in-memory databases. The PowerEdge R6415, PowerEdge R7415 and PowerEdge R7425 are designed to scale-up as customers’ workloads increase and have the flexibility to support today’s modern data center. Like all 14th generation PowerEdge servers, the new servers will continue to offer a scalable business architecture and intelligent automation with iDRAC9 and Quick Sync 2 management support. Integrated security is always a priority and the integrated cyber resilient architecture security features of the Dell EMC PowerEdge servers protects customers’ businesses and data for the life of the server. Edge computing deployments – The highly configurable, 1U single-socket Dell EMC PowerEdge R6415, with up to 32 cores, offers ultra-dense and scale-out computing capabilities. Storage flexibility is enabled with up to 10 PCIe NVMe drives. Software-defined Storage deployments – The 2U single-socket Dell EMC PowerEdge R7415 is the first AMD EPYCTM-based server platform certified as a VMware vSAN Ready Node and offers up to 20% better TCO per four-node cluster for vSAN deployments at the edge1. With 128 PCIe lanes, it offers accelerated east/west bandwidth for cloud computing and virtualization. Additionally, with up to 2TB memory capacity and up to 24 NVMe drives, customers can improve storage efficiency and scale quickly at a fraction of the cost of traditional-built storage. High performance computing – The dual-socket Dell EMC PowerEdge R7425 delivers up to 24% improved performance versus the HPE DL385 for containers, hypervisors, virtual machines and cloud computing2 and up to 25% absolute performance improvement for HPC workloads like computational fluid dynamics (CFD)3. With up to 64 cores, it offers high bandwidth with dense GPU/FPGA capability. On standard benchmarks, the server with superior memory bandwidth and core density provided excellent results across a wide range of HPC workloads. The new line of PowerEdge servers powered by AMD EPYC™ processor will be available to channel partners across the globe, so they can cover a broad spectrum of configurations to optimize diverse workloads for customers. Dell EMC PowerEdge R7425, R7415, R6415 are available now worldwide. vSAN Ready Nodes are available now with the PowerEdge R7425, R7415 and the R6415.